Earlier this month, Facebook announced the new and returning feature for its resident advertisers and social media marketers. The additional and returning updates on detailed targeting options help marketers segment their audience reach accordingly. It helps them filter only those relevant to their businesses. Segments such as the Page Admins, School Targeting, and Field of Study Targeting are new updates facebook marketers are excited to experiment on. 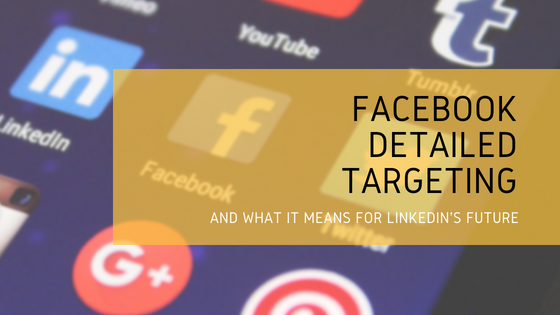 The Employer Targeting and Job Title Targeting, however, were previously tested by Facebook in late 2016. It wasn’t long until they were removed but are now making a comeback with new possible features. Although some are only reinstalled, it is difficult to notice that the set of targeting updates were primarily focused in finding people based on their professional and educational background. While LinkedIn is the top known business and employment program, its features is seamlessly built specifically for white-collared workers. Facebook may as well be looking into the opportunity to connect jobs with blue-collared workers; something LinkedIn failed to support. In fact, one in four people in the US have used Facebook to search and even find a job. “40% of US small businesses report that filling jobs was more difficult than they expected. We think Facebook can play a part in closing this gap,” says Facebook’s Local VP Alex Himel. This market opportunity is a $1.1 billion worth in revenue that Facebook could snag from LinkedIn/Microsoft, based on their 2017’s final quarter revenue report. According to Facebook, the update roll-out will be gradual. Expect the new and returning features to be available on your ads manager soon, without any specific date of release. Detailed targeting helps marketers define their market audiences by customising their segments by demographics, interests, and behaviours. The preview of your possible audience selection by using the custom segments are also shown on the right side of the ad manager. The potential reach of your ad is affected by two factors: 1.) the audience preferences – which can be further optimised by location, age, gender, languages, detailed targeting, connections, and 2.) your ad budget. Facebook’s new update on Detailed Targeting further supports advertisers in finding their right audience. But filling the blank spaces provided by Facebook alone doesn’t guarantee quick conversion – especially if your competitors are fishing on the same pond. There are two ways in using the Detailed Targeting feature: broad and narrow targeting. Detailed Targeting does not limit your segment with just one match. In fact, it even lets you work with multiple matches to narrow down on your potential reach. This can help you find the specific people who will see your ads by containing your campaign in a very specific set of restrictions. These will serve you a smaller portion of potential reach – but this smaller reach may have a higher potential in conversion than of a larger audience. For an example, a hotel management may want to publish a hiring post for an in-house digital marketing specialist – preferably someone with hotel management background. The first segment would be to include the job position: Digital Marketing Specialists. Narrow down with another set interest: hospitality management studies and hotels. Originally, the segment of Hospitality Management and Hotels delivered 2,300 – 10,000 reach. But by filtering down the industry with the profession you’re looking for, Facebook will create a smaller niche of your audience consisting of 210 – 680 Facebook users who are proficient in both Digital Marketing and the hotel industry. Narrow targeting also considers the exclusion of people from your ad reach; which, as the name already suggests, restricting a specific demographic from seeing your ads. Contrary to narrowing your niche, broad targeting is a great option for large-scale brand awareness campaigns. This procedure is typically used in fishing for potential customers at the top of the sales funnel or the awareness stage of your marketing strategy. If you’re a local fitness gym wanting to spread brand awareness and brand recall, publishing a large-scale ad may be the best option to get your brand out. This is especially effective if you’re running a new promotional campaign such as membership discounts. Broad targeting also helps you create an effective starting block in identifying which users should you specifically target next. It offers great statistics on the type of user demographics most likely to respond to your advertisement, which will help your campaigns in the future. Learning when to customise your ads for a broad or narrow target audience is critical for the success of your campaign as it sets the traffic quality you are getting. It is crucial to understand that one method of targeting is no better than the other. The process will always depend on the goal you ultimately want to achieve. Customising your ad strategy and split testing is most likely the best option in achieving your campaign’s goals. What’s your opinion on Facebook strengthening their professional targeting? Comment them down below, or contact us for your ideas now.